Protect, preserve, and facilitate transport with this sturdy storage bag. The large case is ideal for holding your artificial Christmas Tree, and it helps to eliminate hassle during set up and tear down. Not only will you have ample storage space to hold virtually any size tree, you'll also have long term security, and a simple way to carry it to and from your garage, closet, basement or attic. The double zipper closure opens all-the-way up for easy access, and it zips securely shut to keep everything safe for storage. Heavy duty straps are added in four places, so you'll have a double-thick handle for horizontal holding, but also the ability to hang or carry in a vertical orientation by using the additional handles at each end. Simply break down your tree like normal, then place all of the pieces into the large storage compartment. Once you zip it shut, everything inside will be protected from dirt, dust, insects and the possibility of damage. The durable cover will ensure that your tree looks great when it's time to decorate, and it will reduce frustration when it's time to put the decorations away. Long-Lasting. The durable fabric will flex to conform to odd shapes, and it will resist tearing and other damage as it covers and protects your tree. Space-Saving. Ample storage space when needed but compact when not. Fold it flat when your tree is up, and it takes up very little space. Easy-Transport. Four heavy-duty handles are located at different locations so you can easily carry or hang the bag, any way you want. Large. Other versions will only accommodate smaller trees, but this one will easily contain ones that are larger. Versatile. The obvious use is dictated by the name, but this large bag can be used for other décor items too. Easily store and protect large, lightweight items like garland and wreaths just as easily. Measures 48" x 15" x 20". 4 Integrated handles for easy transport. 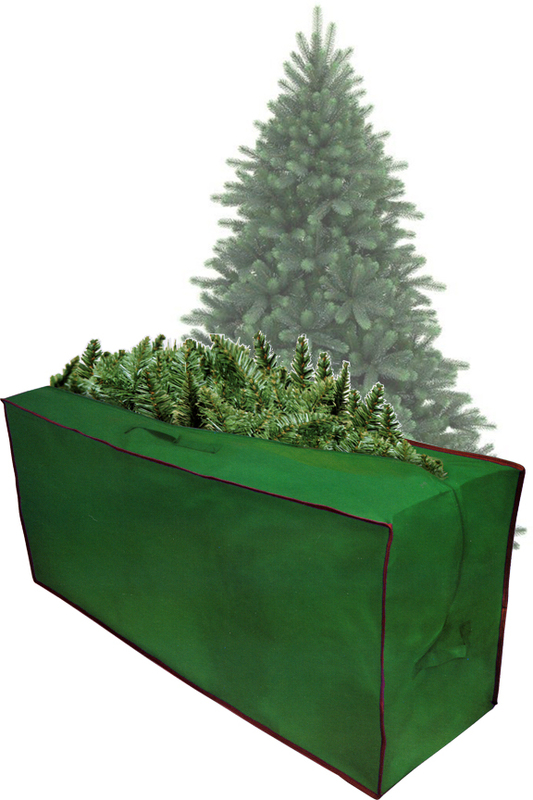 Dimensions 48" x 15" x 20"
Uses Store and organize artificial trees to keep them protected in the off season. Compatibility Use with virtually any fake Christmas Tree. Integrated Handles Yes. (reinforced for strength) Double handles for holding horizontally, and a handle at each end for vertical orientation. Zippered Closure Yes. Double zipper that opens up the full length of the bag.